Idaho is a premier destination for whitewater rafting with 31,000 whitewater river miles stretching across the state. The Snake River in Hells Canyon and the Salmon River, also known as the River of No Return, are among Idaho's most popular rivers for guided trips. Listed below are a number of commercial guides and outfitters that run rafting trips on the rivers in Idaho. Many of the companies offer more than rafting. Visit their web sites to learn more about the adventures waiting for you. National Geographic's "Best Adventure Travel Companies on Earth," ROW Adventures is Idaho's most experienced adventure travel company guiding trips in Idaho for over 30 years. ROW Adventures guides more Idaho rivers than anyone on earth! We specialize is whitewater rafting, kayaking, guided fly-fishing, and multi-sport vacations for the adventure travel enthusiasts. Trips ranging from 1-11 days, we cater to all groups sizes and abilities. Be sure to think of ROW for all of your Idaho, Montana or Oregon adventures! We are the leaders in adventure river trips. There is excitement and relaxation for everyone. We provide the safety and comfort your family needs to travel in Idaho's backcountry. We are a family run company in business since 1983. Our trips are all-inclusive starting with hotel accommodations the night before we launch, roundtrip transportation, sumptuous meals and snacks, certified kid friendly guides, and all equipment. Idaho whitewater rafting since 1969--O.A.R.S. 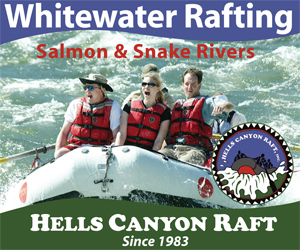 specializes in guided multi-day whitewater rafting trips on the Middle Fork of the Salmon, Main Salmon River, Gorges of the Lower Salmon and Hells Canyon Snake River. O.A.R.S. rafting trips include inflatable raft and wooden dory boat options. Recognized by National Geographic Adventure as "The Best River & Sea Outfitter on Earth," O.A.R.S. sets the standard in first-class rafting, sea kayaking and multi-sport. O.A.R.S. caters to active travelers of all ages and abilities with experienced, professional guides and top notch equipment offering more than 75 itineraries worldwide. Wilderness River Outfitters are proud to offer the best selection of wilderness river vacations, from the Owyhee Canyonlands to the Middle Fork Salmon. Our low guest to guide ratio allows us to cater to a variety of interests within our group. We'll customize your trip to fit your interests and abilities. One thing is sure, you will begin your trip as our guest, and leave as our friend. Contact Wilderness River Outfitters to book your next river adventure. Our popular trips book early, so give us a call soon to book the trip of a lifetime! Cascade Raft and Kayak. 7050 Highway 55, Horseshoe Bend, ID 83629. Phone: 208-793-2221; Toll-free: 1-800-292-7238. Middle Fork River Expeditions. PO Box 70, Stanley, ID 83278. Toll-free: 1-800-801-5146. Rocky Mountain River Tours. PO Box 206, Stanley, ID 83278. Phone: 208-345-2400. Rivers: Middle Fork of the Salmon River. Wapiti River Guides. PO Box 1125, Riggins, ID 83549. Toll-free: 1-800-488-9872.